The conversation with my husband that I dread more than any other is, “what would you like to have for dinner this week?” And then he shrugs. How can someone have so little opinion about what they eat? For an uber-picky eater like myself, I want absolute involvement. So when, one day, he said, “Can you make this?” and shared a recipe for chicken and asparagus stir fry, he had my attention. I agreed to make it and put it on the weekly meal plan – I wanted to reward him, if you will, for being involved in the decision! But also, the simple ingredients showed promise of being a really easy dinner that tasted great. 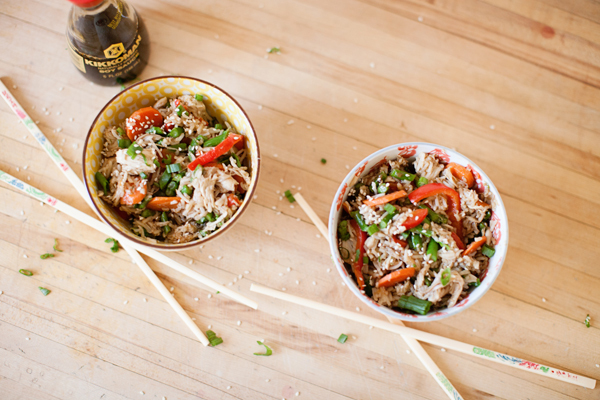 Winner winner Asian-inspired chicken dinner… this has become a go-to staple in our house! Katie at GoodLifeEats.com got us started, and I’m so glad she did! But as I do with just about any recipe I find (when I’m not just cooking on the fly), I’ve got to make it my own. The carrots and asparagus stay! 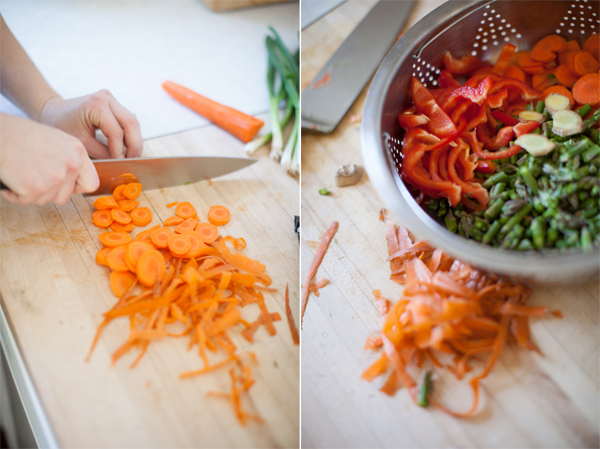 I expanded the rainbow and added an extra serving of vegetables with thin slices of crisp red bell pepper. We keep the garlic, but swap the dried ginger for fresh. Seriously – I can’t even put in to mortal words how much I enjoy fresh ginger. The sweet almost citrus smell, the delicate yellow color, the way it makes any food just pop with freshness. I even like grating it. I did marry a ginger, so maybe I’m bias! 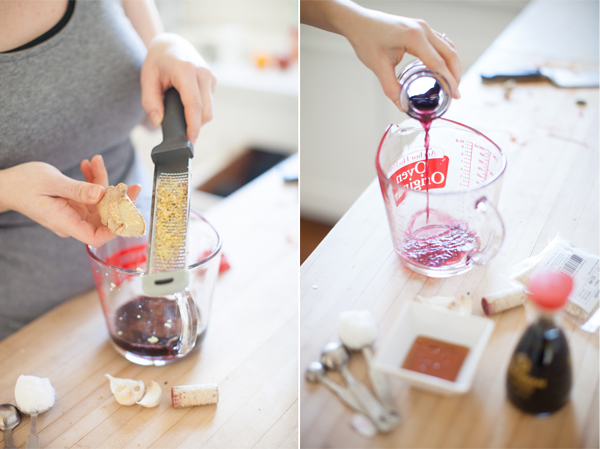 I use red wine in place of cooking sherry or broth. There’s usually the bottom of a bottle waiting to be used and it adds more big flavor to this dish. I also tend to skip the soy sauce when preparing this for my family; it reduces the sodium (40mg per serving without the soy sauce; 716mg per serving with) and they can add it on the side if they like. 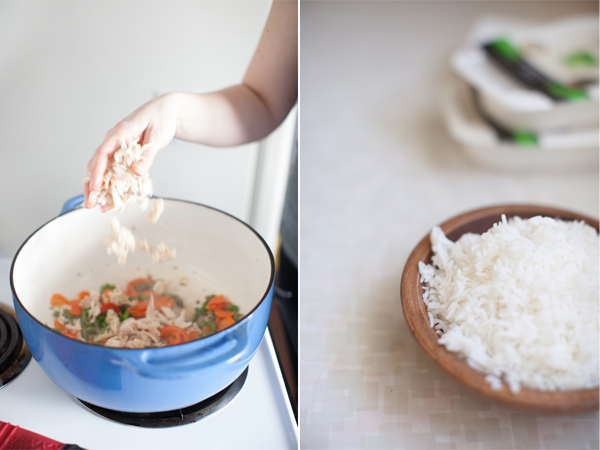 First – the rice. Mine never turns out, and I feel like it adds another 30-40 minutes to the cooking process. But when I stumbled on these little Veetee Dine-In packages of rice at my grocery store, I stocked up! I buy the basmati over jasmine because it offers three grams of fiber instead of just one. Just peel open and serve. Talk about a time saver! Second – the chicken. I’ve made this with raw chicken, which I cook in coconut oil first, and flavor-wise it’s fine, but it adds to the prep time. My preferred method on the chicken is to make a roasted chicken over the weekend and save a cup of dark and white meat aside for this recipe. A rotisserie chicken from the grocery is the fastest approach and works just as well, too! I love the addition of honey in this recipe, it’s the closer that makes the dish sticky and sweet. 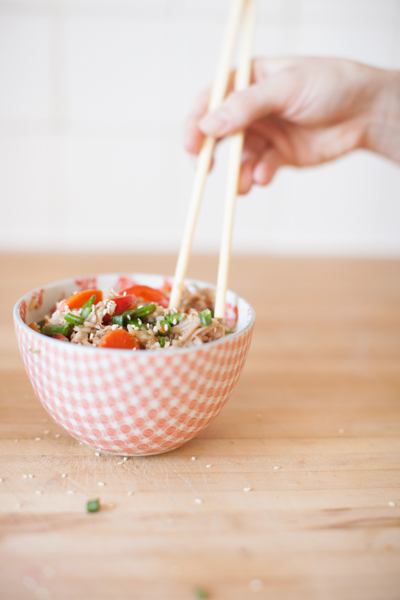 With a few time savers like the rice and chicken, and the ability to carry over some ingredients from other meals on your weekly plan, there’s really no excuse for actual carry-out when you can have this served in about 20-30 minutes! 1. 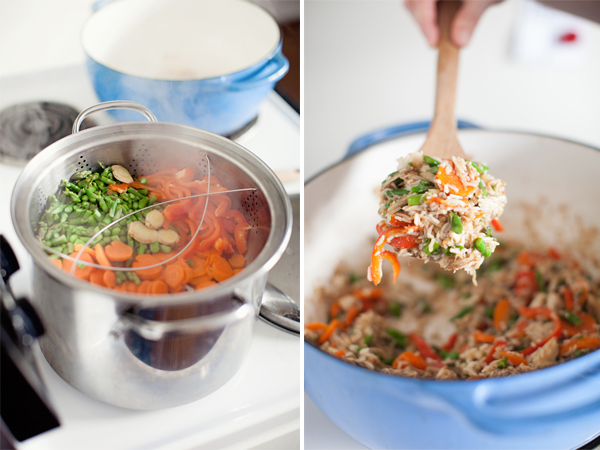 Bring a steam pot to boil while you wash and prepare the asparagus, carrots, and peppers. Let these steam about 5 minutes then strain and rinse with ice cold water. Set aside. 2. 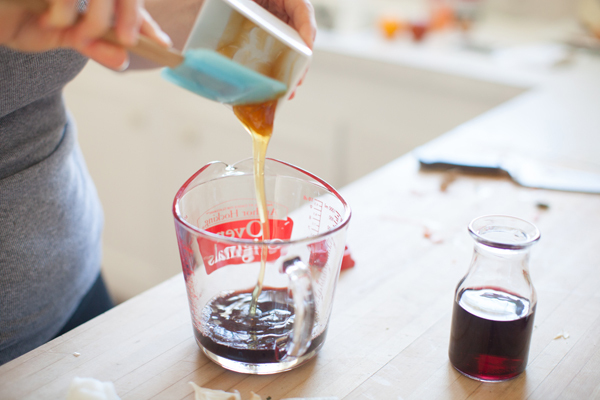 Prepare the sauce with red wine, honey, ginger, and cornstarch (soy sauce if you’re using). Whisk together until well combined and set aside. 3. In a wok, large sauté pan, or Dutch Oven, warm the coconut oil on medium high heat. Add the minced garlic and sauté for about a minute, but not so long that it burns. Add the chicken (which should already be cooked), and then the vegetables. Let this cook for a minute or two before adding the sauce. Finally, add the cooked rice and fold the ingredients together. 4. Serve immediately with finely chopped green onions and/or sesame seeds sprinkled on top if you like.